New Zealand’s indigenous people are called the Māori, or tangata whenua, and their rich heritage forms an important part of the country’s identity. Originating from the islands of Eastern Polynesia, the Māori people journeyed to New Zealand on canoes hundreds of years ago. Throughout New Zealand, there are places where you can experience the rich traditions of the Māori. From traditional dancing in Auckland to staying in a Marae in the untouched forest of Whanganui National Park, we’ve rounded up the best places to learn about Māori culture. 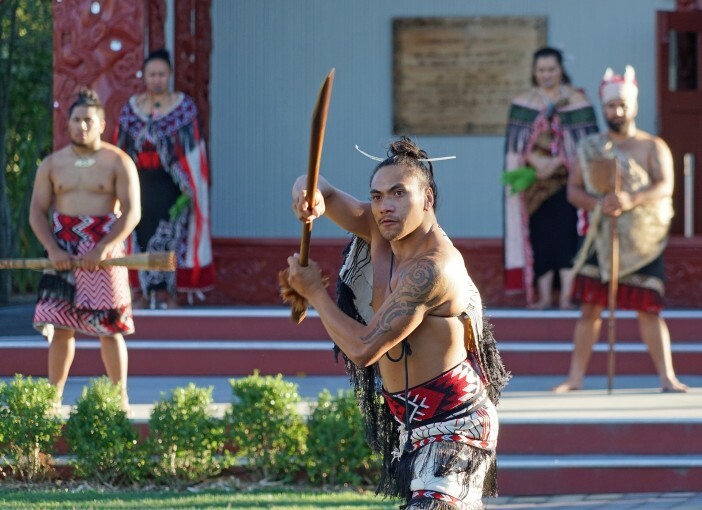 Rotorua is one of the best places in New Zealand to experience Māori culture, with several traditional villages offering immersive experiences. One of the best of these is Tamaki Māori Village, which welcomes visitors onto traditional scared ground in the Rotorua Forest. In the mysterious forest, you can fully experience life in a Māori village as you take part in ancient rituals and learn about this fascinating culture. Art displays such as weaving, wood carving, and even tattooing, show how important art was to the Māori culture and way of life. You can learn the poi dance and the famous haka war dance, as well as taking part in warrior training. Song, dance and feasting follow this packed day of activity. As the first place the Māori landed hundreds of years ago, the Bay of Islands is a great place to discover the culture that spreads out across the country from this starting point. It is home to the Waitangi Treaty grounds, which preserve the site where the 1840 pact that ended the hostilities between the Māori and Europeans was signed, which gave birth to modern New Zealand. There are also tour companies that provide Māori experiences in the area, both of traditional Māori culture and how the way of life is kept alive in contemporary Māori families. Auckland War Memorial Museum is a great place to get a glimpse of Māori culture if you don’t have time for one of the more immersive experiences. The museum puts on daily performances which tell the story of Aotearoa New Zealand and Tamaki Makaurau Auckland. Using traditional dance and storytelling, the powerful performance culminates in a haka war dance. After, you can meet the performers and find out more about the cultural group, which operates under the blessing of Ngati Whatua, the local Māori tribe. It makes for a fascinating experience that is especially suited to short stopovers in the city. Whanganui National Park centres around the Whanganui River, which was used by early Māori to facilitate trade and communication. They established communities within the native forest around the river and cultivated sheltered terraces, creating a network of pa along the river. Today, the forest is still used by the Māori, as the plants and animals play a significant spiritual and cultural role in their way of life. You can stay overnight in a Marae and experience this ancient forest for yourself. It’s a truly magical way to get in touch with Māori culture. Wellington’s Te Papa Museum is a huge source of information on the traditions and culture of the Māori people. As well as a variety of models, arts, crafts, and even interactive displays, the museum works with local tribes to preserve traditional artefacts. They are also involved in the repatriation of Māori ancestral remains from international institutions, an important step in repairing damage done to tribes in New Zealand. With wonderful collections and workshops, this is a great place to get an in-depth insight into Māori history and culture. Christchurch is home to South Island’s only Māori village experience, which is located in the Willowbank Wildlife Reserve. Ko Tane is an immersive experience that allows you to look into three centuries of Māori history, including the effect of European contact on their way of the life. With traditional Māori performances and the chance to eat a dinner cooked in a traditional underground hangi oven, this is a great way to discover the unique culture of the Māori people. The Māori Tours in Kaikoura are a very different way of experiencing Māori culture, and much more intimate than immersive villages or museums. Run as a family business, you are shown the area by tribe members who have over 800 years of unbroken family history in the area. Learn about the Māori connection to the land, and how this translates into a 21st-century lifestyle that honours ancient traditions. This is a unique experience that you won’t find anywhere else. Hokitika offers a unique opportunity to see the beautiful greenstone carvings that have been created by Māori craftsmen for centuries. With a variety of workshops and galleries, you can see craftsmen in action and even try your hand at carving the beautiful stone yourself. There are also several educational tours available in the town to learn about the stone and its importance to Māori culture. If you’d like to learn more about Māori cultures and traditions, why not take advantage of one of Cruise1st Australia’s amazing deals on a cruise that stops in these cultural hotspots? Browse the full collection online or call our friendly sales team on 1300 857 345.